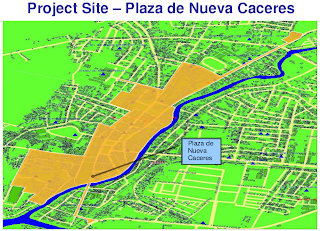 AFTER hurdling scrutiny by the Sangguniang Panlungsod, both at the committee level last week and at its regular meeting this morning, the city government is converting the current island between the Naga City Public Market and Atlantic Bakery into Plaza de Nueva Caceres. The Arts and Culture committee hearing chaired by Councilor Badette Roco featured interesting comments and suggestions by historians Dr. Danilo Gerona and Jose Barrameda, Jr.
Jose "Jojo" Barcena, Jr., descendant of Federico Barcena who crafted the Plaza Quince Martires monument, conceptualized this new historical landmark meant to celebrate the beginning and end of Spanish reign over Naga. Its scale model is shown above. The project site and Jojo's descriptive text of the proposed monument, which he calls "Oragon," follows after the jump. We hope to finish it in time for the opening of the 4th National Filipino Heritage Festival, which will be held in Naga on April 29 and 30 next year. The name "Plaza" would not be appropriate as it is a mere road island. It will of course not be a plaza at all but a mere monument, unless maybe the road between the island and the atlantic bakery row be converted into a "plaza" space. The buildings from the corner of Benito Commercial to the corner of the unfinished Aristocrat International Hotel are also old unsightly buildings and establishment. I can suggest that they be asked to renovate under one facade so they may look like one big building although of different owners. The design must also be like some old spanish building to compliment the plaza/monument. Regarding another issue, the lamp posts recently erected along the streets at the city's centro are no different from any other places you go like libmanan and many other highway municipalities going to Manila. These lamp posts are but modern design and does not fit or match the city's image as an old city. Take a look along Elias Angeles Street and notice the stark contrast it gives to the USI facade, and to the walls of the Archbishop's Residence. Those lamp post never brought up the beauty that is in the oldness of the USI facade and the surrounding buildings like the Naga Cathedral and the Minor Seminary building. Try to look at the new building of the Villa Caceres Hotel and you will see how the lamp posts match the old-design building. Those lamp post may be good only along the Magsaysay Ave, and probably within the CBD-II. But CBD-I is different. The lamp posts may be replaced with old-design types and the ones to be removed be placed instead along the Div. Road and within the CBD-II but nowhere within the CBD-I including the Barlin, E. angeles and Penafrancia Ave. areas. Naga must be promoted as an old city as it really is. We know that old cities are more well revered and are considered truly classy than modern ones. making naga look like a contemporary 1700's will make a good statement for the city. naga will restore it's place as once a spanish city. thus, naga must be different from all other modern cities in the phils. this will also attract more visitors if we can make them feel as if they're not in the phils or back in time. cbd. Panaflex signages destroy its beauty.